Against Anti-Semitism An Anthology Of Twentieth-Century Polish Writings | Free eBooks Download - EBOOKEE! 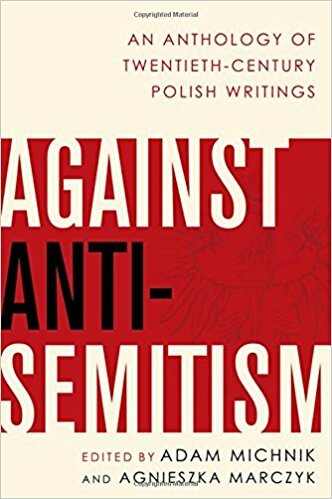 Adam Michnik, Agnieszka Marczyk, "Against Anti-Semitism: An Anthology Of Twentieth-Century Polish Writings"
Poland's relationship with its Jewish population has long been a subject of often agonizing debate. In September 1939, there were approximately 3.3 million Jews living in Poland, the largest population in Europe. In May 1945, between 40,000 and 60,000 remained. Most of the Nazi death camps had been located on Polish soil. The intertwined issues of wartime complicity and victimhood haunt Poland to this day, complicated by the unavoidable fact that anti-Semitism in Poland existed well before the outbreak of the Second World War, and has existed long after it. The deadly Kielce Pogrom in July 1946 appalled the world, since its victims were precisely those Jews who had miraculously survived annihilation. And while with the years physical violence against Jews diminished-if only because there were not many at whom to direct it-anti-Semitism has remained no less virulent, emerging as a force in Polish politics, religious life, and in society at large. A study undertaken in 2002 determined that one in nine Poles believed the Jews collectively responsible for the crucifixion of Christ. One in four claimed that Jews were secretly Descriptionting to rule the world. Is anti-Semitism integral to Polish identity? Nowhere has this question been more the cause of soul-searching than in Poland itself. In this volume, Adam Michnik, one of Poland's foremost writers and intellectuals, and Agnieszka Marczyk have brought together the most significant essays of the twentieth century written by prominent Poles on Polish anti-Semitism, including by such writers and intellectuals as Czeslaw Milosz, Leszek Kolakowski, Jerzy Andrzejewski, and Tadeusz Mazowiecki. Taken from a three-volume original Polish edition, 3,000 pages in length and containing 320 entries, the essays, most of which have been translated into English here for the first time by Marczyk, resonate with Michnik's central argument-that anti-Semitism is not a given of Polish culture. It has been consistently challenged and rejected. Taken together, through their collective courage and wisdom, expressed even in moments when reason seemed lost, these essays and their authors remind readers not only of the destructive and self-destructive elements of anti-Semitism, but of the necessity of combatting it in all of its forms. Even some of the darkest parts of Polish history have produced moments of illumination. No comments for "Against Anti-Semitism An Anthology Of Twentieth-Century Polish Writings".